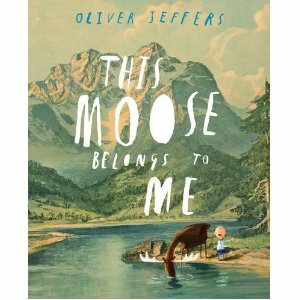 If you and your children read Oliver Jeffers’ Stuck, a picture book termed “giggle-inducing” by Kirkus Reviews, a Best Book of 2011 and that School Library Journal described as “laugh-out-loud hilarious”, your kids will enjoy his This Moose Belongs to Me, a whimsical take on the concept of ownership. A concept too subtle for the picture book set, you say? I beg to differ and so does Mr. Jeffers. An Irish artist, designer, illustrator and writer, he has come up with a “Gee, I never thought of it that way” book about what determines ownership of a living thing in the great outdoors and subtly begs the question, why do we cling to a need for it? Jeffers’ case is made via a moose christened Marcel by his young discoverer, Wilfred. Wilfred is a true believer in the old saying that “possession is nine-tenths the law”! Not only is he heavy into ownership of Marcel as soon as he sees him, as in “he just KNEW it was meant to be his”, Wilfred is also a determined rule maker for this monopolized moose. He immediately puts into effect a “How To Be a Good Pet” list of dos and don’ts. Some rules Marcel unwittingly complies with, as in Rule #4: “not making too much noise while Wilfred plays his record collection.” Compliance is an easy exercise here when Marcel merely wanders away; a case where not to be around, infers obedience. At the outset, Wilfred seems a bit slow on the uptake as to how the wilderness functions, but give the boy time, folks. He’ll catch on. Wilfred is in for quite the eye-opener as he finds Marcel has had many “previous owners”. Oh say for instance, the proper woman with purple hair, who suddenly appears and lays claim to the moose with cries of “Oh Rodrigo! You’re back!” Who’s RODRIGO? Seems Marcel is in for an awakening, of sorts. Marcel aka Rodrigo has had a number of “owners”, all with very possessive personalities, who confuse his love of apples for hallmarks of affection for THEM! Kids will count Wilfred and “purple haired lady” among this group! But wait! Will Wilfred have an epiphany as he is forced to admit he never really “owned” Marcel, and might a compromise not be reached in this relationship whereby Marcel complies with the rules only when the moose sees fit? Sounds like the trumpet of freedom’s call has triumphed. And just who’s this fellow in clerical collar, looking for a moose called DOMINIC and claiming him as his own? Seems the word is not completely out there – yet. Looks like it’s up to readers and Mr. Jeffers to help spread the word. There is an old saying that to have change occur, one must first admit there is something that needs changing. Oliver Jeffers’ witty and whimsically wise picture book has taken a giant stride in that direction when it comes to the mania for “that belongs to me” as it applies to Mother Nature. Kids will love this book and “get it” as it does so without resorting to preaching. Instead it cheerfully demonstrates the sheer foolishness of anyone “owning” the great outdoors and its inhabitants. And it never hurts to laugh while the lesson is being taught. A tip of the antler to Marcel, Rodrigo, Dominic or whoever you are. I would have called him Monckton, but that’s another story.